COLUMBIA COUNTY/LAKE CITY, FL – The Lake Shore Hospital Authority (LSHA) is a special taxing district established by the Florida legislature. All members of the board have been appointed by Governor Rick Scott. December 12 was the last official 2016 meeting of the LSHA Board. Moments after the Board began consideration of the evening's agenda, Board Chairman Koby Adams announced that he was asking the Board to approve a workshop on January 9, 2017, at 4 pm. Mr. Adams, who is also Representative Elizabeth Porter's Chief of Staff, did not volunteer one word of explanation regarding the purpose of the workshop. Chairman Koby Adams announces the Jan. 9 workshop. 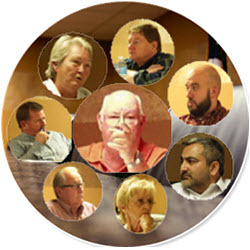 All members of the Authority Board are required to be residents of Columbia County. Dr. Waseem Khan made the motion to approve the meeting. Dr. Khan's homestead exemption is in Alachua County. Board member Brandon Biel seconded the motion. It passed unanimously. None of the Board members mentioned the purpose of the workshop, which is essentially a special meeting. Since the early 70's both the Florida Attorney General and the Courts have established that "reasonable notice" is mentioning the purpose of a meeting so that people can decide whether or not they wish to attend. Did the Governor's Board Know the Purpose of the Workshop? Only Board member Ron Foreman gave an indication that the Board knew the purpose of the meeting. Moments before the meeting was adjourned, he said, "We're moving it forward. I guess the workshop will unveil what we've been doin'." On what appears to be December 22, ten days after it was announced that the Board would "unveil what we've been doin'," the decision was made to cancel the unveiling. There was no announcement on the home page of the Authority website, nor was the cancellation noted on the Authority calendar. 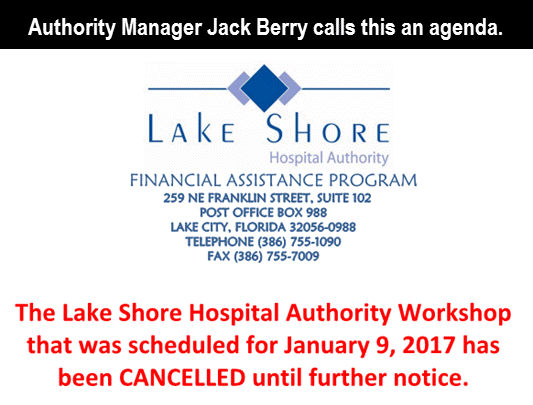 Authority Manager Jackson P. "Jack" Berry posted a notice on what he called an "agenda." The Governor's Lake Shore Hospital Authority: does it know what an agenda is? And what has the Gov's Board been doing, and apparently continuing to do in secret, that requires an unveiling and then a mysterious cancellation?